Such a good feeling to be settled in one place….at least for a little while. Spent most of the day getting settled in before walking the beach. Here is the new campsite complete with my little potted herb garden and a fireplace tucked in back. This entry was posted in Uncategorized and tagged A Month Of Sundays, Dream Living in an RV, GRATITUDE, tincantravelerPhotos. Bookmark the permalink. This looks idyllic! I wish you many beautiful sunny days to relax out here. 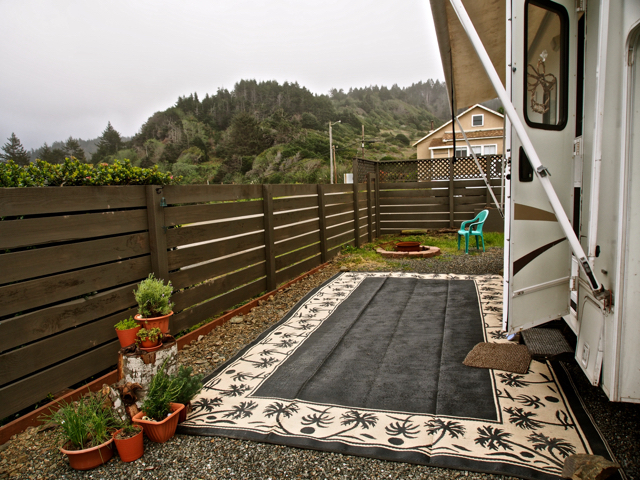 The personal private little homey space you’ve created, and the mountainous coastal setting. I like your rug. I wanted to tell you when you make that chicken just put in a small amount of pepper. I just use a pepper grinder and do about 4 turns.